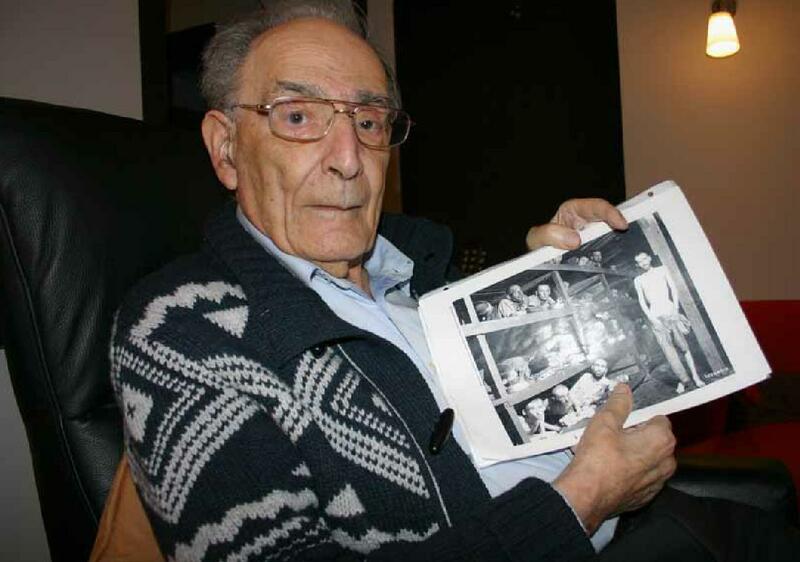 Max Hamburger, a Jewish-Dutch psychiatrist, is the man in the above photograph taken in 2012. He is 92 years of age. The photo was retrieved from this pdf . Hamburger has identified himself as the fourth figure in the bottom row of the famous Buchenwald photo — the figure he is pointing to with his thumb. He was 25 years-old in April 1945 when the camp was “liberated” by American troops. I want you to notice right away the space between Hamburger’s nose and upper lip — it is unusually long. The face of the young man in the famous photo does not have that long space, but just a normal, or even short, distance between nose and mouth. This is facial structure that doesn’t change, which tells me he is not the same person. Born on February 10, 1920 in Amsterdam, Max began the study of medicine in 1938 and, as best I can make out from Dutch language sources, he was arrested in 1942 because of his activism in the Dutch Resistance and sent to Westerbork, a camp for political prisoners in The Netherlands. He ended up in Auschwitz and then Buchenwald, he says, taking the usual route. According to this page, he was suffering from TB, and also malnutrition, when the famous photo he’s holding in his hands was taken. 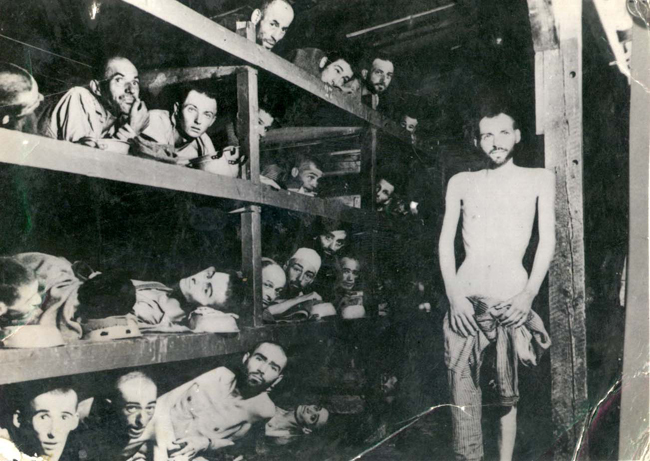 On the second bunk from the bottom, third from left is Losh Wertenberg who later changed his name to Yehuda Doron, and according to other identification this man is Jeno Marton (identified by Yaakov Marton). Screwy. Yad Vashem accepts whatever is sent to them because the memorial is by, for and about the Jewish people and they can do no wrong. However, we, of more discriminating nature, have to doubt that any of these names are correct … except Grüner. Does Max Hamburger have a valid claim to be “the zombie” in the photograph? It’s important to remember that this photo is recorded as having been taken on April 16, five days after the actual liberation. If this 4th person in the lower bunk had TB, would he still be lying in this barracks 5 days later or would he be in a hospital? If this were a hospital barracks, why do some of the men look so healthy? Elie Wiesel did not have TB, but, according to his own accounts, two days after liberation he ended up unconscious in the SS hospital with severe food poisoning. So Wiesel couldn’t be in this picture by his own statements! 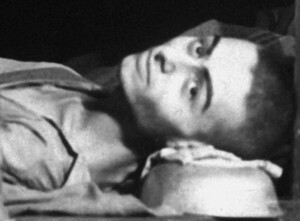 Nicholas Grüner also had tuberculosis (TB) when this photo was taken. However, Grüner seems to think it was on the day of liberation, April 11, because he writes in his book Stolen Identity that as they were being marched to the camp entrance on that day (believing they were being taken somewhere to be killed), he managed to leave the line and run into the nearest barracks and jump into an empty bunk — which was this one. Later an American soldier came in and took a picture. Grüner was only 16 and had been living in the special children’s barracks, the same that Elie Wiesel says he was in. Grüner says his TB was not diagnosed until he was fully processed and he was then sent to a sanatorium in Switzerland, where he recovered. If Max Hamburger is the fourth man on the bottom row, he must also be the third man in the next row up (2nd row) because they are the same man. Yet he doesn’t say that — so something is very wrong with his claim. The nose, eyes and eyebrows, and head lined up perfectly one with another. This would not be possible if the two faces were not the same person. 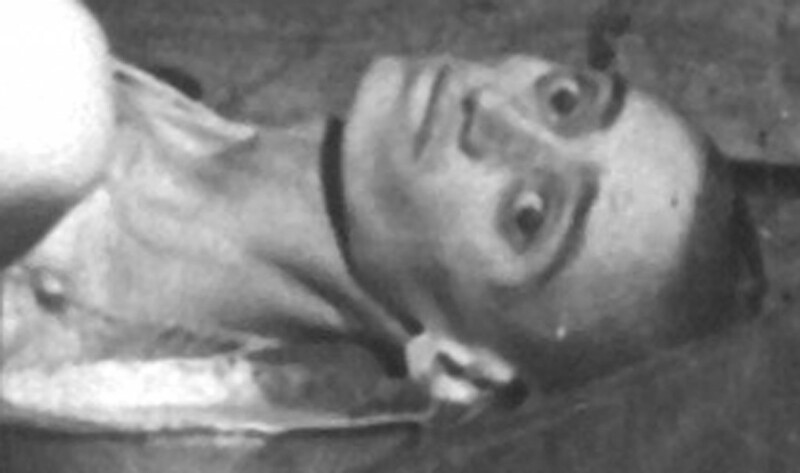 The mouth, while also remaining identical, is shifted upward on the “zombie” (as you look at the photo) and the entire lower face is widened and the jaw squared off. I do not know how this was accomplished – with a photographic process or with paint — but that’s what it is. 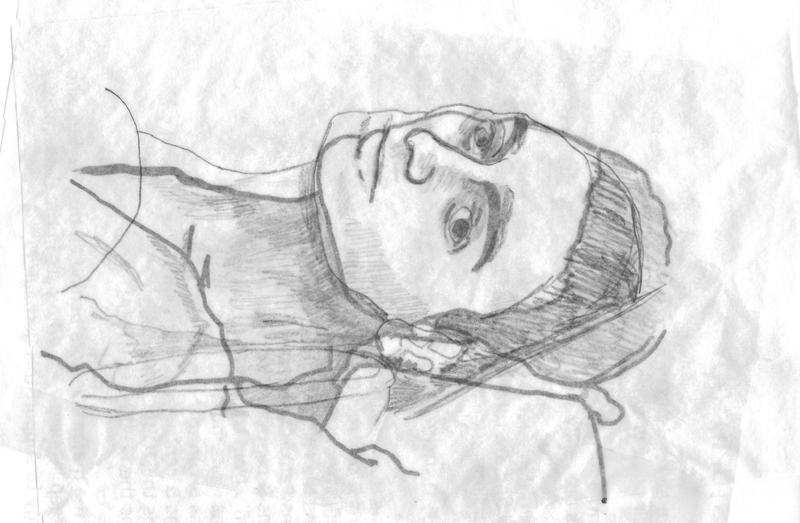 The head is re-situated as laying flat on the bunk board (from the original pose of being propped up a few inches), necessitating a change in the relationship to the neck. I thickened the outline of the “original” so it’s easy to tell which is which. Here are the small photographic images of the two faces (left: 2nd row; right: bottom row) so you can compare with the overlay. Why not just use a different person? Why would they decide to insert the same man and then have to go to such lengths to make him look different? I really cannot answer that. Perhaps they thought someone who was already in the room would have the right look and lighting. Perhaps someone thought it would be easier than it turned out to be. As I pointed out before, this “copy” was also not gauged correctly size-wise — he is noticeably smaller than the men in the bunk right above his. He is the son of a Dutch diamond polisher and baseball player, Hartog Hamburger. During a competition game in 1924, Hartog was hit on the head by a line drive when in the field. He died the next day as a result of the impact. In February 2010, Max participated in the panel discussion of the Aachen Rabbi Mordechai drill in the German city of Aachen, along with the artist Máro and several others. 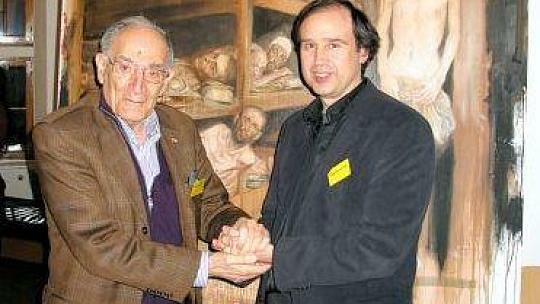 “The discussion was all about the [then] 90-year-old Holocaust survivor Max Hamburger, whose speeches have gained great respect and […] the painting shown in the Castle Gallery by Máro, the image of a scene from the Buchenwald concentration camp.